Following our successful development of Loc8tor Plus , a revolutionary and award-winning device for keeping track of lost items, Loc8tor then worked with us to define a credit card-sized handset, now on the market as Lo8tor Lite. This meant we had to miniaturise a directional antenna to fit in the right size and use very low-power design techniques to be able to get a long life out of a small battery. The Loc8tor Lite is now made for purchase worldwide. Loc8tor is a UK based technology company that develops and has brought to market award-winning locating devices that help find important possessions and can even prevent them from getting lost in the first place. 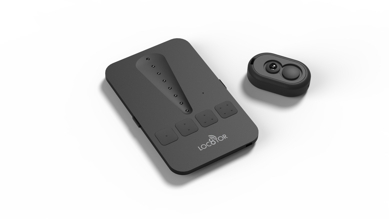 By blending the best of old and new technology Loc8tor provides the first affordable homing device of its kind that actually guides you which way to walk, and which can be used across a myriad of personal and professional applications. "Over the last 7 years we’ve worked closely with the team at ASH to develop and bring to market numerous RF based locating products. Their experience right from the early design stages to post production support has been invaluable. We see them very much as an integral part of our team and found them incredibly responsive in all our dealings. We look forward to working with the team at ASH on future projects."